NETWORK FINALS: BIG BROTHER and SHADES OF BLUE gained 0.1 in final numbers, while the IHEARTCOUNTRY FESTIVAL lost the same. CABLE HIGHLIGHTS: It was an up-and-down night for HBO, where SHARP OBJECTS jumped 0.12 to 0.36, and the season finale of SUCCESSION rose 0.07 to 0.20, but LAST WEEK TONIGHT was down 0.07 to 0.27. On AMC, a WALKING DEAD preview special for next season was at 0.44, pushing PREACHER up 0.08 to 0.30. Scripted was led by Starz’s POWER, up 0.03 to 0.56. TNT’s CLAWS edged up 0.02 to 0.44. Adult Swim’s VENTURE BROTHERS returned at 0.34. Hallmark’s CHESAPEAKE SHORES returned at 0.21. 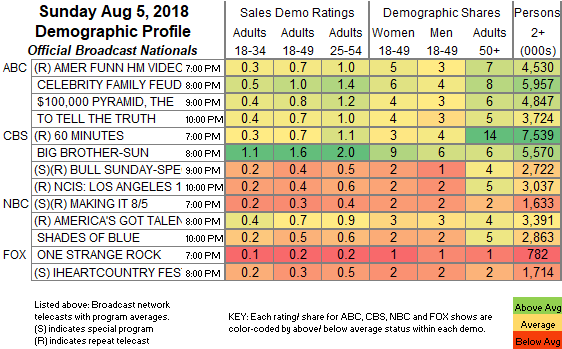 On Showtime, WHO IS AMERICA continued to build, up 0.03 to 0.13, a pivotal episode of THE AFFAIR gained 0.02 to 0.10, and OUR CARTOON PRESIDENT ticked down to 0.03/101K. E!’s season premiere of KEEPING UP WITH THE KARDASHIANS shared the Sunday cable crown at 0.64, in line with last year’s 0.70 premiere, and lead-out VERY CAVALLARI had a one-tenth boost to 0.32. ESPN’s MLB SUNDAY NIGHT game was also at 0.64. 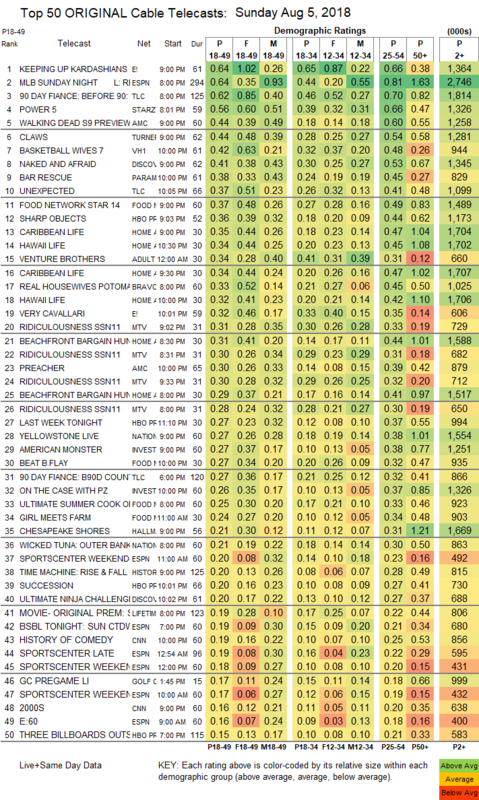 On TLC, 90 DAY FIANCE was at 0.62, compared to last week’s 0.70/0.54, and UNEXPECTED returned at 0.37. On VH1, a special Sunday BASKETBALL WIVES was at 0.42. Discovery’s NAKED & AFRAID crashed by 0.27 to 0.41, and ULTIMATE NINJA CHALLENGE premiered at 0.20. Paramount’s BAR RESCUE had a 0.12 leap to 0.38. On Food Network, FOOD NETWORK STAR lost 0.07 to 0.37, and BEAT BOBBY FLAY was down 0.02 to 0.27. HGTV’s line-up was led by CARIBBEAN LIFE at 0.35/0.34, compared to last week’s 0.36/0.33. Bravo’s REAL HOUSEWIVES OF THE POTOMAC returned at 0.33. MTV’s RIDICULOUSNESS was at 0.31/0.30/0.28. On ID, AMERICAN MONSTER was at 0.27, and ON THE CASE was down 0.05 to 0.26.